Get Deadly Valentine for free! 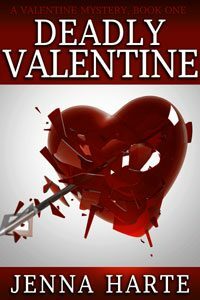 Subscribe to my newsletter and get Deadly Valentine, the first book in the Valentine Mystery Series for FREE! Books are available in Mobi/Kindle or ePub. Want to read a snippet of Deadly Valentine before you buy? I think I’m going to puke. Tess studied her face in the nineteenth-century Louis XV-style mirror in Asa Worthington’s foyer. Pale, but not green. Still, the rolling in her stomach told her things could get worse. Why she’d let Daniel Showalter talk her into attending his uncle’s dinner party she didn’t know. It had disaster written all over it even before her stomach threatened to embarrass her in front of the town’s most elite family. Recently, Daniel’s actions suggested he wanted more than friendship. Not that Daniel was a bad guy. He was handsome, down-to-earth and Tess loved his parents as if they were her own. But she was as committed to celibacy as one could get, short of joining a convent. She’d given up on the idea of love ever after, preferring the sensual delights of chocolate, Marvin Gaye tunes and couture French underwear instead. But it wasn’t Daniel’s affection for her that threatened to ruin the night. It was his uncle. Asa Worthington was a volatile, intolerant, self-serving man whose gatherings usually involved patronizing or humiliating everyone in attendance. Even Asa’s sister, Helen, found him so distasteful that she hadn’t been to a family function in over twenty years. The night was proving worse than Tess anticipated when Daniel’s cell phone rang, calling him back to duty as a police detective just as they arrived. So she stood abandoned and stranded in the foyer hoping her lunch didn’t reappear and mess up the beautiful Italian marble floor. The things one did in the name of friendship. She pushed a tendril of chestnut hair out of her face and hoped that the glass of water the butler was bringing would settle her stomach until she could figure out how she was going to get home. Tess lifted her gaze to find a pair of brilliant blue-green eyes reflecting back at her through the mirror. She hadn’t thought the night could get worse. She’d been wrong. Was it too much to hope to go through the rest of her life never seeing those eyes again or anyone else from her old life? After all, Jefferson Tavern, Virginia was a long way from Washington, D.C., not so much in distance as in social importance. There was no reason for him to be so far from home. Perhaps the man whose reflection she watched move toward her was an apparition. Maybe the mirror was one of those commonly found in historic homes in which ghosts appear through the reflection. The only problem with that idea was that most ghosts in Virginia were from the Revolutionary or Civil wars. This man was very modern. So maybe her brain was as addled as her stomach and conjured up the vision. Her head was feeling a little foggy. The only way to find out for sure was to turn around and face him. That was laughable. No one ever forgot Jack Valentine. Particularly women. Even a woman like Tess who’d given up on men. He was a romance novel’s alpha male come to life— gorgeous, rich, arrogant, and yet somehow endearing. There was a time she would have liked to indulge her attraction to him. That time was long gone. His brows drew together. Clearly he expected a different reaction. He probably thought she’d throw herself at him like she did the last time they were together. She wouldn’t make that mistake again. “What are you doing here?” she asked not hiding her impatience. A flash of annoyance crossed his handsome face. It was so fast that she would have missed it if she wasn’t staring at his mesmerizing eyes. “I didn’t know you knew Asa.” What were the odds that Jack would know Asa Worthington? Jack was in in the security tech business while the Worthingtons were in media. When would their paths have ever crossed? “I came with someone, but he was called away,” Tess clarified. He was standing close, too close. He was studying her and she did her best to hold his gaze without giving away her unease. Or worse, blushing. He didn’t need to know that after all these years he still made her insides flip-flop. “Only this one.” Jack maintained his gaze on Tess. “Tess! You’re here. Good. Where’s Daniel?” Tom Showalter asked of his son as he came to stand next to Asa. The two men were complete opposites. Asa’s presence in a room remained even after he left while Tom could go unnoticed in a crowd of two. He was average in every way, from his lackluster mud-colored eyes, to thinning brown hair. It always struck her as odd that as different as they were, Asa and Tom were good friends. Perhaps Tom being married to Asa’s sister, Helen, helped. Or maybe it was that Tom was Asa’s lawyer. “He got called away as we got here,” she said. “Oh. Well, hopefully he won’t be long. I see you’ve met Jack Valentine,” Tom said. Tess’ eyes grew large, then narrowed with suspicion. It wasn’t unusual for Jack to be brazen. What was disturbing was that it was directed at her. “Have you ever been handled by a woman, Mr. Valentine?” she said, with bravado she didn’t feel. Tess followed Asa with Jack and Tom behind her. Although she’d been to Asa’s mansion before, she always marveled at the exquisiteness of his home. The Georgian-styled structure was built in the late 1800s by Asa’s great-great grandfather and it held many original pieces. With a fire to offset the February chill, the room looked warm and inviting, but it couldn’t quite overcome the stiff coolness that was the Worthington family. “Where is Walter?” Asa asked in a clipped tone. An older gentleman appeared, looking like he stepped out of a 1930s whodunit-novel, complete with a black butler suit and white gloves. “There you are. Champagne for everyone,” Asa said with a wave of his hand. Walter made no acknowledgment of his boss. Instead he handed Tess a glass of ice water. Walter gave her a brief nod in response and then headed to the bar in the corner, presumably to get the champagne. “We’re waiting for a few more people,” Asa said. Despite the abundance of seating, everyone remained standing in the middle of the room. Ready to flee at a moment’s notice. “While we’re waiting you can tell us what this dinner meeting is about,” Jack said. Jack’s eyes narrowed and he looked as if he was going to press Asa. “You’ve got a beautiful woman at your side who has been stood up by my nephew. Why not take the time to enjoy the company?” Asa added. Tess didn’t much like being pimped out. She could only hope that Jack wouldn’t take the bait. “Finally,” Asa said as Walter handed out flutes of golden bubbly. Tess passed on the champagne. She was beginning to feel more wobbly and didn’t need people to think she was drunk. “More water, Ms. Madison?” Walter asked. “Stop flirting with the guests,” Asa snapped. Tess bristled at Asa’s treatment of his butler. She looked to the others to see their reaction, but there wasn’t one. That’s how it was, Tess reminded herself. Few people ever really looked at or noticed the help. Her own parents treated the servants more like furniture; functional when needed, forgotten when not in use. “To big business and even bigger money.” Asa held up his glass. Everyone joined him, raising their glasses then sipping the champagne. “As usual, Asa, the champagne is wonderful,” Tom said. “Oh, I don’t know. I imagine you could get away with whatever you wanted,” Jack said with a hint of accusation. “He usually does.” Tom nodded in agreement. “Seems to me that without the antitrust act, young entrepreneurs would have a difficult time being allowed in the game.” Tess tried to sound matter-of-fact instead of annoyed. It always bothered her how rich people felt entitled to special treatment. “Good evening everyone,” a young man said, as he entered the room alongside a woman who she stepped out of a glamour magazine. “Mother called as I was coming downstairs.” Philip’s eyes asked his father not to embarrass him. “Needed more money, no doubt,” Asa said in disgust. Philip was a duller version of Asa with lackluster gray eyes and black hair. Even the sophisticated wife with flawless glowing skin and perfectly coifed bob did little to enhance Philip’s presence. “What does it matter to you, Asa?” the woman said. “There’s plenty for everyone,” Philip said. There was a noticeable silence following Asa’s venomous retort. While it was known that Philip wasn’t the bulldog in business that Asa was, he did work alongside his father, and as a family run business since its founding by Asa’s great-grandfather, it was assumed that Philip would be the next leader. The only Worthington not to run the company was Asa’s father, who instead had gone into politics. He’d been a Virginia senator for nearly forty years and would likely die of extreme old age in his D.C. office. Or maybe everyone’s shock was the fact that Asa made no attempt to hide his contempt toward his son. But anyone acquainted with Asa knew that he had high expectations and low frustration when those expectations weren’t met, even by his family. Especially by his family. “Have you met everyone, Philip and Shelby?” Tom interceded. “You remember Tess Madison, Daniel’s friend. This is Jack Valentine from D.C.” Everyone exchanged pleasantries. “Philip’s wife and mother, and Helen, my wife, along with a few other of their friends just got back from New York on their yearly girls’ weekend out. I understand y’all made out pretty good this year,” Tom said, clearly trying to steer the conversation into a more pleasant direction. “We did alright.” Shelby said, in a tone that made Tess think she didn’t make out nearly as well as she would have liked. Tess wondered if Asa had them on a tight allowance. “Just what is it that women do when they’re together?” Asa asked looking at Tess. Asa was right. She was where she was now because of her own efforts. At twenty-nine years old, she had built a modest private practice in a town in which lawyers were a dime a dozen. She felt she should be proud, but pride wasn’t what she felt when her past came to mind. She gulped down the last bit of her water and immediately regretted it. “Tess.” Jack extended his hand to lead the way. “I just need to sit down a minute. Don’t let me disrupt your meeting.” Tess excued herself. She hadn’t gone two steps when she felt a hand on her lower back. The zing in her blood let her know it was Jack. She felt him lean toward her, his breath tantalizingly warm on her ear. Click here to get the digital version of the entire book FREE!